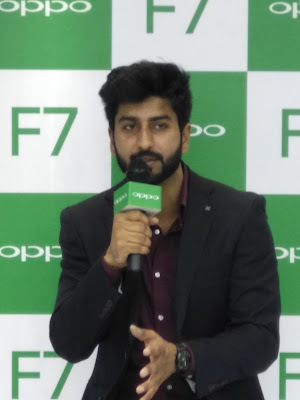 Oppo has announced the launch of its Oppo F7 Diamond Black 128GB variant in Bangalore, India.This was announced at the Oppo F7 launch event in the city recently, the Diamond Black edition comes with 6GB of RAM and 128GB of inbuilt storage. A Solar Red variant with 6GB RAM and 128GB storage was also due to launch soon. The custom variant adorns a multi-layered metallic and glass back. Subsequently, it is steeply priced at Rs. 26,990 - in contrast, the regular variant with 4GB RAM and 64GB inbuilt storage is priced at Rs. 21,990. Starting April 21, the Oppo F7 edition will be available for purchase across Flipkart, Amazon.in, Paytm, and all Oppo offline stores across the country. The dual-SIM (Nano) Oppo F7 runs ColorOS on top of Android 8.1 Oreo. It sports a 6.23-inch full-HD+ (1080x2280 pixels) Full Screen 2.0 display with a 19:9 aspect ratio. The handset is powered by a 64-bit MediaTek Helio P60 SoC, coupled with up to 6GB RAM and up to 128GB of onboard storage. In terms of camera specifications, the Oppo F7 bears a single 16-megapixel rear camera with an f/1.8 aperture and certain AI recognition features. On the front is a 25-megapixel selfie sensor with f/2.0 aperture and real-time HDR. There is a 3400mAh battery powering the internals from under the hood. "We always appreciate the feedback of the youth and try and come up with devices that fulfill the demands of our young consumers. We feel the colour of the device will resonate well with the youth as smartphones are an extension of one's personality in today's day and age. With the F7 Diamond Black version we have tried to incorporate an enthralling design with an amazing storage of 128GB to ensure our consumers can store all their precious memories spent with friends and family," said Rishabh Srivastava, Product Manager, OPPO India.